Abraham Lincoln said many inspirational things during his life. Only one of the answers below is something he actually said, however. Select the quote which you believe comes from Abraham Lincoln. Poet Maya Angelou dedicated her career to words. Select the answer below which is a real quote of hers. Albert Einstein is considered one of the greatest minds of all time. Select the quote which can be attributed to him. Nelson Mandela said many inspirational things throughout his life. Select the quote which can be attributed to him. Stephen King has written a lot of words over the years. Select the quote below which can be attributed to him. The Dalai Lama has said many things over the years to try to bring about a more peaceful and loving world. Select the quote below which can be attributed to him. Picasso generally communicated through his art but occassionally he would use his words as well. Select the answer below which can be attributed to him. Poet Robert Frost once famously summed up life in just 3 words. Select the answer below which completes the following quote, "In 3 words I can sum up everything I've learned about life: ____ ____ ____"
Congrats! Your fake-news detector is strong and working at a high capacity. Nobody is going to be able to get much passed you. Sorry to say it but you are unable to tell the difference between real quotes and fake. Unfortunately, this means you will have to be extra diligent to make sure the news your reading is real. Living in modern times means being able to tell fake news from real. One aspect of this is being able to tell real quotes from phony. 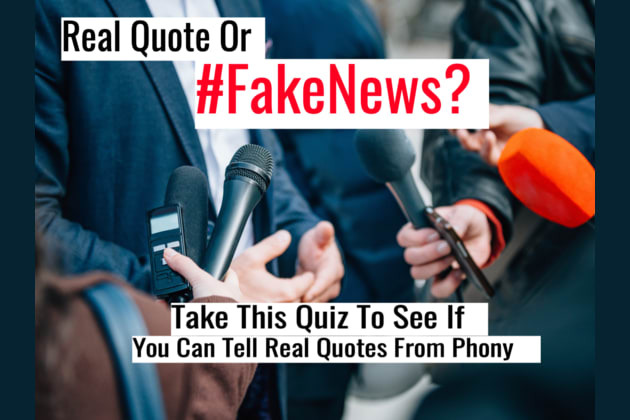 This quiz will determine whether you are able to weed out the fake news from the real.